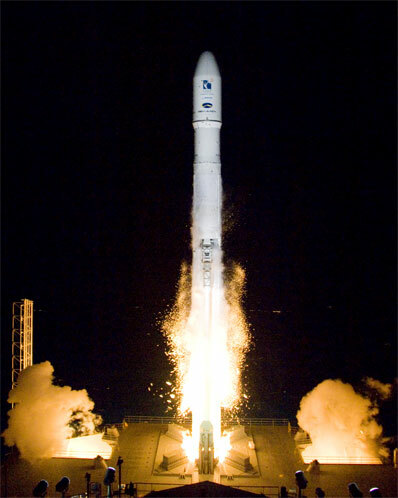 One year after a Sea Launch Zenit rocket was engulfed in a dramatic launch pad explosion in the middle of the Pacific Ocean, the Ukrainian booster successfully returned to the skies Wednesday to haul an Arab mobile communications satellite into space. "This was an opportunity that we've been looking forward to," said Rob Peckham, Sea Launch president and general manager. "It's an opportunity to succeed and this team did succeed." With its RD-171 engine blazing with 1.6 million pounds of thrust, the 200-foot-tall Zenit 3SL rocket blasted off the Odyssey launch platform at 1149 GMT (6:49 a.m. EST) Tuesday. Odyssey was positioned in the Pacific Ocean along the equator at 154 degrees west longitude. The three-stage rocket turned east away from the pad after liftoff, heading just south of the equator as it dropped its two lower stages and payload fairing into the Pacific Ocean. The Russian Block DM-SL upper stage fired twice during the mission, first to reach a temporary low-altitude parking orbit, then to power the Thuraya 3 satellite into a much higher geosynchronous transfer orbit. The upper stage deployed the 11,381-pound spacecraft on schedule about one hour and 39 minutes into the flight, putting a successful punctuation mark on Sea Launch's 25th mission. "This is one the biggest victories we've had in the history of Sea Launch," said Valery Aliev, manager of Sea Launch's rocket operations. "This is rocket science and it's always an honor when something like this is executed so flawlessly, as it was today," said Jim Simpson, vice president of business development at Boeing Satellite Systems, builder of the Thuraya 3 spacecraft. A California ground station received the first telemetry signals from Thuraya 3 moments after spacecraft separation. "This spacecraft, though not the heaviest, was probably the most difficult and challenging one for us," Aliev said. "We were looking into our customers' eyes and we really wanted to pull through for them." The rocket accurately discharged the payload in an orbit with a low point of 460 miles, a high point of 22,243 miles, and an inclination of 6.2 degrees. "We're extremely satisfied with today's mission results," Peckham told an excited crowd of employees and customers gathered at the Sea Launch home port in Long Beach, Calif. The last time a Zenit rocket launched from the converted Norwegian oil platform, a wayward chunk of metallic debris lodged inside the first stage engine's liquid oxygen turbopump caused the power plant's fiery destruction during the ignition sequence. After losing thrust, the rocket fell through a flame duct opening on the launch pedestal and exploded. 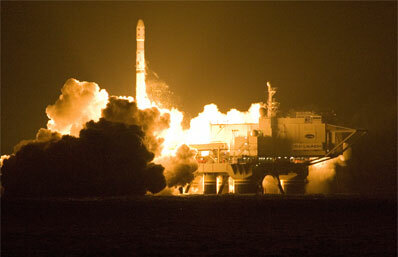 The January 2007 failure was a major setback for Sea Launch, which lost several satellite contracts to competitors. The fireball damaged several critical parts of the Odyssey platform, including a 600,000-pound flame deflector, hangar doors, communications antennas, and a maze of wires and cables, according to Sea Launch. A new flame deflector was manufactured in Russia, and Odyssey was sailed to a shipyard in Vancouver, British Columbia, for other repairs and repainting. High winds and strong ocean currents forced Sea Launch officials to postpone the launch from an initial series of attempts in November. The poor conditions forced officials to eventually turn back and return to port after several weeks at sea. The vessels set sail again around New Year's. Monday's launch of Thuraya 3 was a textbook mission, putting last year's bitter failure behind the Sea Launch team as the company begins a busy stretch of missions from both the Pacific and the Baikonur Cosmodrome under the Land Launch venture. "We have recovered from the difficult failure; we have conquered the weather that we experienced during the first part of the Thuraya 3 campaign; and we have shown to the world that our launch team is one of the best in the world," Aliev said. Thuraya 3 will continue to refine its orbit over the coming weeks before reaching a final circular orbit at an altitude of about 22,300 miles with an inclination of about 6.2 degrees. The satellite will be stationed in an orbital slot at 98.5 degrees east longitude, high above the eastern Indian Ocean. Thuraya 3 will also unfurl its two solar panels stretching 134 feet tip to tip and deploy a web-like 40-foot mesh antenna reflector. After a comprehensive period of system tests, the spacecraft should be declared operational within the next two months to begin a more than 12-year mission. The craft is the third satellite orbited by Sea Launch for Thuraya Satellite Telecommunications Co., a company based in the United Arab Emirates providing extensive mobile communications coverage to a swath of the planet home to more than 2.3 billion people. Thuraya 1's mission was cut short by a faulty power production system, forcing Thuraya 2 to shoulder the brunt of the company's satellite communications business. The system can currently reach customers throughout the Middle East and Europe, in addition to much of Africa and portions of Asia. But the critical addition of Thuraya 3 will enable the company to expand its services to the Pacific Rim in key markets such as China, Japan, Korea, Australia, and Singapore. "There's been a lot of effort at Thuraya expanding our system and preparing for this launch on the ground, and Thuraya 3 is really the crowning of this effort," said Yousuf Al Sayed, chief executive officer of Thuraya. Thuraya will pursue both land and sea markets in the Asia-Pacific region, according to company officials. "China is a very important market for Thuraya in the Asia-Pacific as a land market," Al Sayed said. "However, Thuraya is also preparing a maritime system for that region due to the extent of the maritime activity there." Thuraya's communications system is based on a marriage of traditional land-based cellular services and satellite-provided communications. Customers inside terrestrial coverage areas can use cellular services, but the phones can automatically switch to satellite mode when in remote areas out of reach of traditional communications networks, according to Thuraya. "We would like to bring the same kind of experience that people enjoy in cities into remote and rural areas as well as in the maritime (market)," Al Sayed said. The handset models include the smallest satellite phone in the world, a device weighing just one-third of a pound that provides built-in data transfer capabilities, a GPS receiver, and a camera. "The users, whether they are in cities and towns or in remote areas, enjoy the same facilities and capabilities regardless of the type of service, whether it's voice or data," Al Sayed said. U.S.-based Hughes Network Systems and Ascom of Switzerland provide the user terminals. The system can handle up to 25,120 simultaneous voice phone calls, according to Boeing. A fourth Thuraya satellite will be added to the constellation in the next few years to serve as a backup, Al Sayed said. Peckham said the next Sea Launch mission is scheduled for March to deliver another communications satellite into orbit.